how the Fraser fir seedling is turned into a Christmas tree. Throughout the tour remarks will be made on local plant identification and wildlife observation. 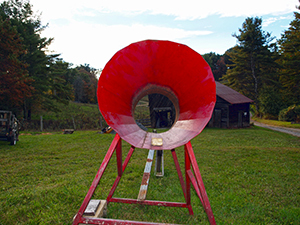 The Swinging Bridge Farm is easy to get to, we are just 15 to 20 minutes from downtown Boone. Just take HWY 421 S as if you were going to Wilkesboro. Eight miles East of Boone make a left on Brownwood road. Go one mile. Make a left on Old Glade Rd and drive half a mile to an old barn that has the sign, FARM TOUR. I will meet you there. 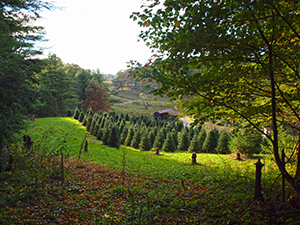 The cost of the Christmas tree farm tour and Nature Hike is $8.00 per adult and $5.00 for children. All tours are by appointment. Call 828 964-2030c or my cell phone, 828 964 2030. 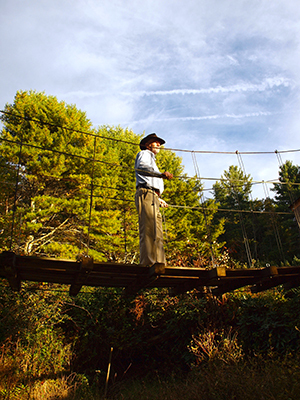 Your tour guide- Chuck Lieberman has been growing Christmas trees and blueberries on the Swinging Bridge Farm since 1980. While running the farm Chuck has been a rural mailman, an instructor at App State, and a columnist for the local paper, the Watauga Democrat. He has written nearly 600 columns on the joys and vagaries of running a small Christmas tree farm in the Blue Ridge. Chuck loves his farm and loves talking about it in both English and Spanish.